Although it may feel like Christmas is a while away, there is no reason why you should not get started on your Christmas marketing campaign now. It is important for businesses to think about how best to take advantage of the holiday season to gain interest and sales via their Facebook account. This article takes you through various tips for a fantastic seasonal Facebook campaign, drawing on the example of Boohoo.com, as they have an extremely well executed Facebook campaign. The first tip would be to include a Christmas theme to your cover photo. This is a simple, easy and fun way to connect with your audience. In this area you could even advertise your special Christmas offer. It is a way of showing your audience that you have things in common with them and humanising your image. The cover photo above, Boohoo.com’s cover photo, brings together their TV advert which can be seen here. Bringing all your advertising together, giving them a collective image, is important in brand recognition which is exactly what Boohoo.com have achieved with their #dressmas campaign. Tell us what you want for Christmas this year? These types of statuses will definitely add engagement to your page. 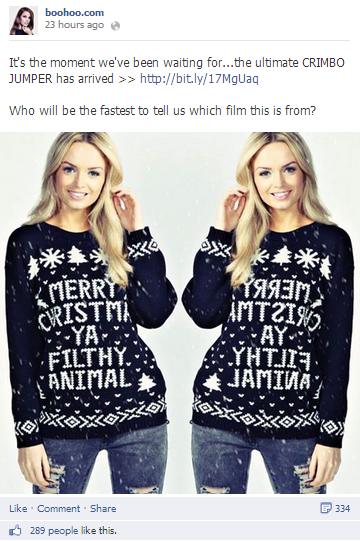 An example is where Boohoo.com who have used the statement ‘Who will be the fastest to tell us which film this is from?’. This post brings together one of their products and the Christmas theme. The post has so far received 334 shares, 289 likes and 282 comments (as of 7th November at 3pm). The more a status can increase interaction the more people see it the post and will visit the website. This leads to my third tip. Once you have people interacting with your posts, statuses and updates it is important that you interact back with them. If people ask questions answer them. This will make them feel welcome into the brand and hopefully make them want to buy! The fourth tip is to offer something to your audience see another Christmas post from boohoo.com. 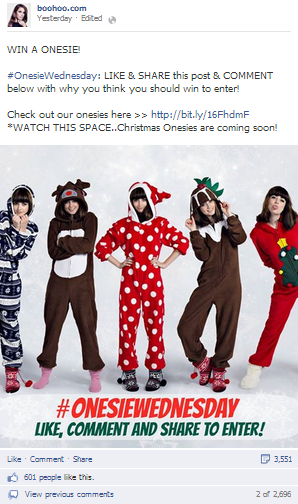 By giving away only one Christmas onesie they have manages to achieve a lot of interaction with their audience. Over 3,500 shares, 600 likes and over 2,500 comments. Through asking their audience to like, share and post to win a onesie they have been able to gain a lot of exposure to promote their new Christmas product. There are plenty of things you can do this Christmas to help promote your business, take the holiday season for granted and push your brand and products to get as much from your Facebook page as possible.